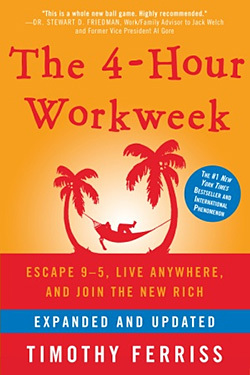 We continue our examination of the business book The 4-Hour Workweek with an interview of author Tim Ferriss. What inspired the book, and why did he follow that up with a book on fitness and diet? What was the impetus for you to write 4-Hour Workweek? It was based on a guest lecture I have given at Princeton University since 2003 in “High-Tech Entrepreneurship,” and my own experience of extricating myself from a self-made prison of a start-up. In the middle was a global walk-about that led to the complete automation of my own business, as well as odd adventures around the world: tango, philosophical epiphanies, etc. The catalyst was having a long-term relationship end in 2004 because of my workaholic schedule. It doesn’t force people to choose between being Jack Welch or being Gandhi, going for uber-capitalist or anti-capitalist. Those appeared to be the choices–black or white. The 4HWW offered case studies in architecting elegant business models (or org charts) that allow maximization of revenue and time simultaneously. Has the rise of Facebook, Twitter, and other social tools changed any of the ideas you had in Workweek? The social tools have made the noise level higher, and the skill to separate signal from noise correspondingly more valuable–more relevant now than when first published in 2007. What was behind the decision to follow up a book on work and productivity with 4-Hour Body, a book about fitness and diet? Most of my readers think I’m obsessed with time management, but they haven’t seen the other–much more legitimate, much more extreme–obsession. I’ve recorded almost every workout I’ve done since age 18. Since 2004, I’ve been tracking everything from complete lipid panels, insulin, and hemoglobin A1c, to IGF-1 and free testosterone. I’ve had stem cell growth factors imported from Israel to reverse “permanent” injuries, and I’ve flown to rural tea farmers in China to discuss Pu- Erh tea’s effects on fat- loss. All said and done, I’ve spent more than $250,000 on testing and tweaking over the last decade. And that was just to satisfy my own curiosity and improve my own physical machine. Then I had a conversation with a Wired magazine writer, in which we joked that the main fears of modern men and women could be boiled down to two things: e-mail overload and getting fat. Shortly thereafter, I realized I had to write The 4-Hour Body. It is, without a doubt, a natural progression, a risk, and the most important thing I’ve ever written. How has your process changed from Workweek to writing 4-Hour Body? Scrivener–formatting into a tentative table of contents, including research in a separate pane. Basecamp–organizing all permissions, interview content, and communication with researchers and to-do’s for assistants. The 22 Immutable Laws of Marketing by Al Ries and Jack Trout: Being different, and positioning, is as important as being better. I use this book as a checklist for launches. Let My People Go Surfing by Patagonia founder Yvon Chouinard: A manual and manifesto for ensuring your values remain intact in the full-contact sport of business. 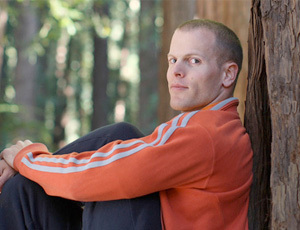 Timothy Ferriss is the author of THE 4-HOUR WORKWEEK (Crown Archetype/Publishers). Read more about The 4-Hour Workweek or our Leadership Hall of Fame.